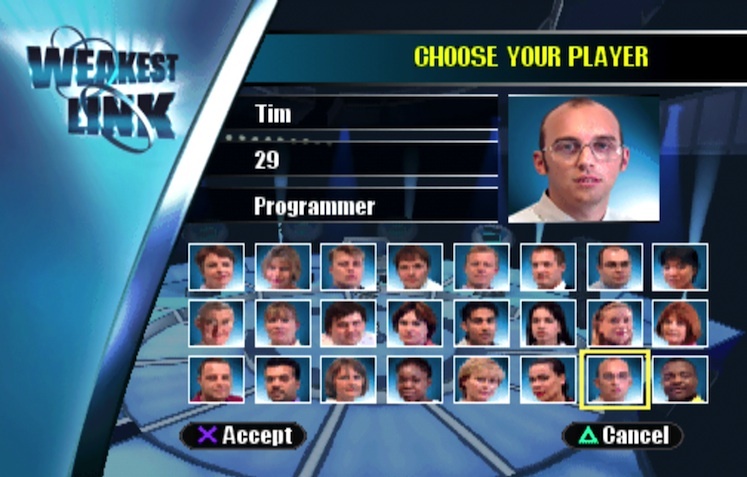 Game shows often get lost in translation from television broadcast to playable video game, but The Weakest Link for the PlayStation manages to defy expectations. The bullet points on the back of the case are alluring: 24 playable characters, 100,000 questions, and voice-over work by the cold-as-ice host herself, Anne Robinson. But along with this is the phrase “home version of the hit game show”, which is almost never a good sign. 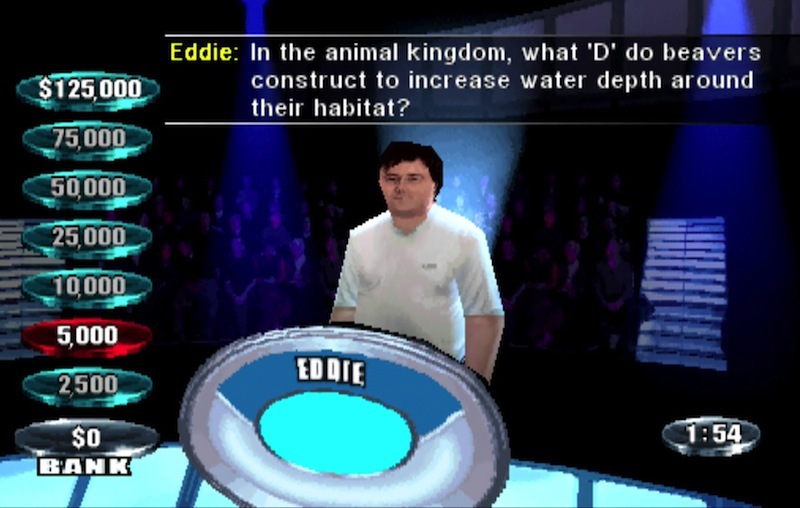 Unlike other “adaptations” (ahem, Family Feud 2012 Edition), The Weakest Link uses a format that sticks delightfully close to its source material. Questions arrive rapid-fire, mimicking the brisk pace of the show, as contestants work together to build a chain, bank when the money is right, and bring as much money into the next round as possible. The show’s psychological aspects carry over as well, presenting a careful balance between cooperation and competition, forcing you to size up and analyze your virtual opponents, and conveying a real feeling of pressure to perform well lest you be called out as weak. If you’re playing multiplayer, these mind games extend to you and an impressive six other local players, so get your DualShock collection ready. In concert with all this, the game’s presentation manages to be pretty spot-on, especially for a PS1 title. The studio set, props, sound effects, and music are all there. Even the camera angles and lighting were clearly designed to evoke the TV show’s techniques. It’s clear that the people making this game had an excellent understanding, and perhaps even a love, of the source material they were working with. 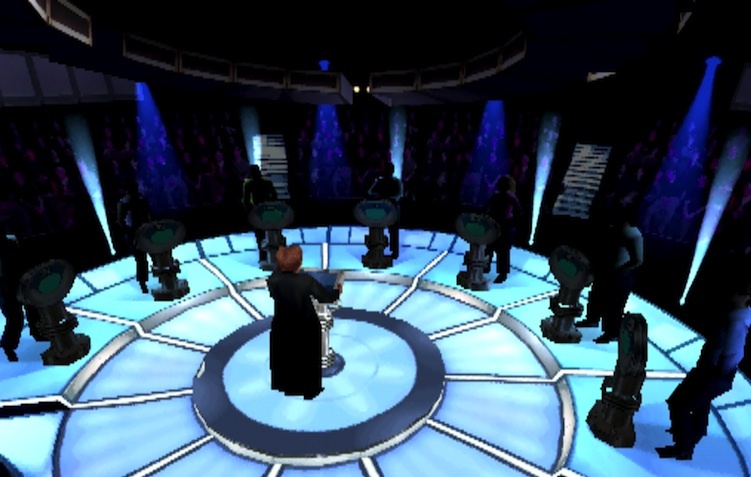 The biggest mistake Activision could have made with The Weakest Link would have been to substitute some lesser host or sound-alike for the classic personality of Anne Robinson. Her harshness, sarcasm, and mysterious lack of emotion define the TV show, so it’s crucial to have them front-and-center here as well. Anne’s borderline robotic lack of emotion actually translates well to the video game format, as it makes it easy to throw together several independent audio clips of her speech without it feeling too disjointed. The awkward phrase “Nick... | in history, | which one of these is right?” is clearly three pieces of audio stitched together, but with Anne’s delivery this staccato feels almost natural. The developers appear to have understood Anne’s importance too, as there’s a wonderfully heartfelt line in the credits thanking her for helping make the game into “the genuine article”. Frank is a retired bank manager living in Phoenix, Arizona. Barry is a cab driver from Brooklyn, New York. Samantha is a store manager from Miami, Florida. Tim is a computer programmer from San Diego, California. None of these people are real, but they have real portraits and real voices, and each of them has a distinct personality. These personalities rely heavily on stereotypes — Tim, the computer programmer, constantly uses the phrase “does not compute” — but they go a long way to helping the player tell other contestants apart from one another. Because of this, you know when Frank is having a bad round, so you know when the other players are going to target him. You know that Samantha is a strong player overall, so you don’t want to end up in the final round with her. Sure, many of these contestants’ voice-over quotes are hilariously over-the-top, but this only helps your recognition of them. Ok, what other video game gives you a setting for controlling “the amount of abuse characters receive after the voting”? Seriously. According to the manual, changing this setting to MORE guarantees you “an especially abusive film clip” when you’re voted off. How great is that? Pretty great. Even with all of the above pieces in place, The Weakest Link wouldn’t make for a very good experience if its source material weren’t so strong. 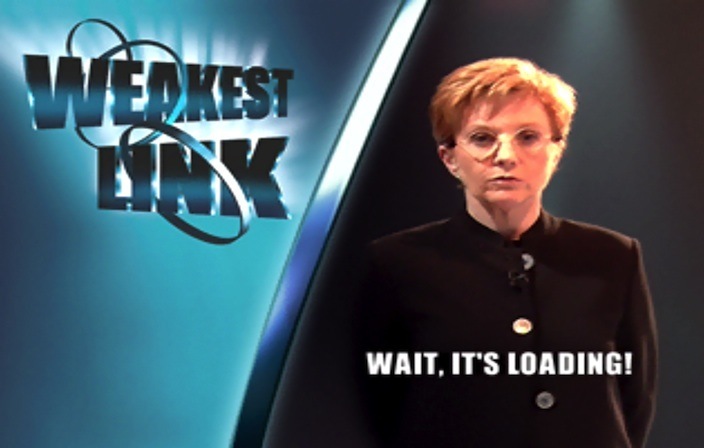 If you look past the gimmicky celebrity episodes and ignore the inane popularization of the “you are the weakest link” catchphrase, Weakest Link has at its core a genuinely interesting set of mechanics. It combines these with dramatic flourish and the iconic personality of its host to produce something that is both fun to watch and fun to play at home.